The Día de la Virgen del Carmen, July 16th, is celebrated in many coastal towns and villages throughout Spain. Places as diverse as Almuñecar, on the coast of Granada province, and Puerto de la Cruz in Tenerife share the festival with many other coastal communities in Andalucia, Murcia, Valencia and Catalonia. The Old Testament prophet Elias, towards the end of his life, became a hermit in a cave on Mount Carmelo. Hundreds of years later, pilgrims trying to follow in the prophet’s footsteps, invoked the protection of the Virgin Mary of Mount Carmelo – Stella Maris, the Virgin of Carmen. Now, the Virgin is the patroness and protector of all seamen, fishermen and even, as we shall see later, scuba divers. Most of the Día de la Virgen del Carmen traditions involve at least one parade through the town, making its way to the sea front. Usually, a flower-strewn effigy of the Virgin is carried through the streets by a group of the local fishermen. When they reach the sea, they are usually met by a flotilla of illuminated and decorated boats, all sounding their horns. After prayers are made for all those at sea, the statue is then customarily taken on a boat, around the local harbour as the fireworks and bands accompany her journey. The Virgin, according to the legend, is responsible for keeping the waters around the shore clean and safe; many devotees used to refuse to swim until after July 16th! Obviously each of the towns holding their own celebrations will adapt the proceedings according to their own traditions. Since 1981, for example, when local scuba divers placed an image of the Virgin on the sea bed, a part of the tradition in Malaga has involved divers paying their own respects to their underwater patron. In Puerto de la Cruz in Tenerife doves are released when the Virgin is taken onto the boat. Always fascinating for visitors, the Día de la Virgen is similar to many of the traditional Spanish festivals in that it manages to combine religious devotion with a seemingly endless capacity for partying – without any sense of incongruity. Being held in the middle of a Spanish summer, barbecues on the beach feature strongly in many places – and very late nights, of course. 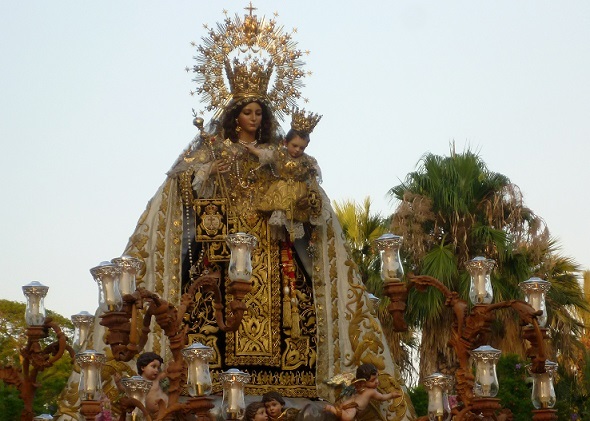 Alicante, Nerja, Estepona, Port de Sóller, Torremolinos and Almería are among the larger towns that enjoy notable Día de la Virgen del Carmen festivals, along with smaller places such as La Cala and Rincon de la Victoria near Malaga. All of them follow the same basic procedures, whilst acknowledging their patroness in their own special ways. Always a stirring celebration, and often profoundly moving, Día de la Virgen days are amongst the most important celebrations in Spain, often uniting visitors and local inhabitants who together symbolically acknowledge the need for protection for ‘those in peril on the sea’.